Product #16852 | SKU KUMO CP | 0.0 (no ratings yet) Thanks for your rating! 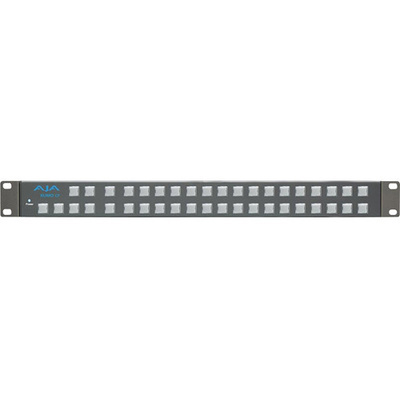 With AJA's KUMO CP Remote Control Panel, you can easily and intuitively control up to four AJA KUMO 1604, 1616 and 3232 routers over an Ethernet connection without the need for a computer. While individual ports can be routed, ganged dual and quad port routing also allows for dual and quad-link SDI routing for raw HD and 4K material. The KUMO CP features 40 buttons and enables selection of up to 32 sources and 32 destinations on each of up to four KUMO routers in standalone mode or through a built-in GUI accessible from any web browser on the network. Utilising its Ethernet network connection, the KUMO CP2 can communicate with up to four KUMO routers anywhere on the network. This allows you to locate control panels wherever they are needed for optimal accessibility. For standalone configurations with KUMO CP, all KUMO routers can be connected together directly using standard RJ45 cables or through a network switch, if required. KUMO software will automatically detect and assign routers to control panel delegations so your routing system is ready for use immediately. In a network environment, the built-in web UI provides all the setup controls to create exactly the configuration you require. Customise the KUMO CP's buttons exactly to your needs. Use text labels and coloured inserts to identify various sources, destinations and routers for quick and easy operation. To get you started, you can download a free lens chip template from the AJA website which can be colour-printed and cut to create an insert for each button. Light-gauge paper or film will be illuminated by the button for easy identification even in dark machine rooms or edit suites.